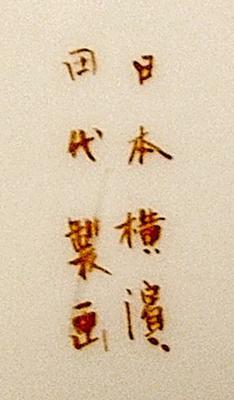 Oriental Ceramics - Pottery Marks in Chinese Query - This is all there is on the back. Oriental Ceramics - Pottery Marks in Chinese Query: My parents left me some China when they passed. This is a set of 8 1/2" plates with only Asian words on the back. I can't find any info on them and wonder if you might be able to help? Please check the pictures. They are quite beautiful and in fine condition. Great query! Thanks for sending it in. If I knew who the maker was I would gladly tell you, but I have no knowledge of Oriental wares. I am quite good on 20th Century UK manufacturers, but foreign and early wares are specialist niches unto themselves with vast amounts of knowledge and research material required. I am very optimistic a visitor will write in the comments section to translate, so scroll down to look for and answer below. Also, just to let you know, Gotheborg.com has a 'Japanese Ceramic Pottery Marks' section, an 'Early Chinese Pottery Marks' section and a 'Later Chinese Pottery Marks'. The work involved in putting that particular site together must have been tremendous, as studying Oriental marks is a very specialist field. As Professor Bo Gyllensvärd, Curator of Asian Art, said "it takes fifty years to become fairly knowledgeable in Asian ceramics". Good luck with your quest and keep us posted. I look forward to seeing a photo of the rest of the plates!